Wash, core and cube apples, leaving peel on. Add to a large mixing bowl. Wash and slice grapes in half. 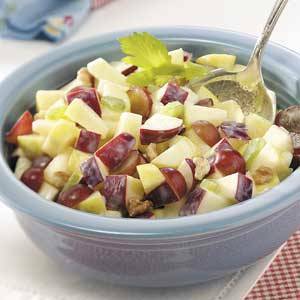 Add to apples. Pour yogurt over fruit and mix. Refrigerate covered for 20 minutes. Divide into individual 1 cup ramekins and serve. 196 members have added this recipe to their cookbook. This was a good recipe! I used vanilla greek yogurt that did not have any artificial sweetener so it actually wasn't very sweet aside from the apples. It was more tart. I really liked it, though. I added a little cinnamon and cashews and liked it even more! I also tried it sprinkled with oats and cinnamon and it made a great breakfast! I will definitely make this again and again! There are 74 calories in 1 serving of Apple Jubilee. Calorie break-down: 3% fat, 90% carbs, 7% protein.